What crazy weather, eh? The last thing that I remember before curling into my bed is the heavy rain brought on by the thunderstorm outside - which made me decide to stay in and wait for a while before hitting my gym. Looks like my plan obviously failed and I just passed out. While I was waiting, I was listening to some Indie Folk bands, including The Wooden Sky, The Rural Alberta Advantage, Forest City Lovers, and Timber Timbre. Then I realized how hot/advanced the Toronto Indie Folk scene is. I have to say though, this genre has been gaining more popularity among the youth just over the last years and it is fantastic to see that Toronto is one of the best places to check out these gifted bands. The band - Ohbijou is in my opnion one f the most talented of them - and they have had a significant influence in that scene. 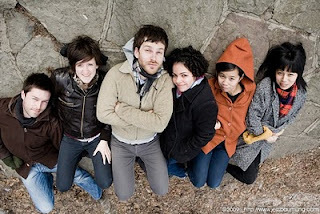 Ohbijou is a Toronto born band who has been touring all across Canadian festivals; playing a countless number of shows. This band was started as a project by Casey Macija - the lead singer - and then expanded it to a band with her younger sister Jennifer, as well as other members to provide instrumental support for the two sisters. I came to know Ohbijou when they participated in the second "Friends in Bellwoods" album. This project is supported by Toronto Indie Rock community and benefits are contributed to the Toronto's Daily Bread food bank. When I first listened to the song "the Otherside", from the "Friends in Bellwoods" album, I was instantly in love with Casey's pure and gentle voice. I started digging them so I checked out a few more songs on their MySpace site. Their music is so perfect on a day like today when you decide to stay in and have a cup of coffee, tea, or whatever else chills you out. I especially like a song called "Black Ice". It is not only because of Casey's, but I love the lyrics of this song; "I took the bus down Bathurst street and saw where all the lonely people meet down there" To me, when I listen to this part of the song, I immediately start picturing the sight of the one of the most favorites places of the city and personalize the song till the end. I just bought their second EP- "Beacon" - this afternoon. I'm a little late discovering this band - it was released in 2009. I love it so much. I have posted some songs from the album which I like; so why don't you enjoy a nicely quiet evening? Treat yourself with a favorite beverage. They are currently on tour on the west coast and no specific dates for Toronto are posted, however; they are from Toronto and I am sure that it won't be long before I can happily announce a show in Toronto for Ohbijou. here is a YouTube video of Black Ice and New Years! Enjoy! !